Table Mountain is home to some beautiful natural features, and that cannot be denied. From its wonderful structure to the vast biodiversity, this is a must see. 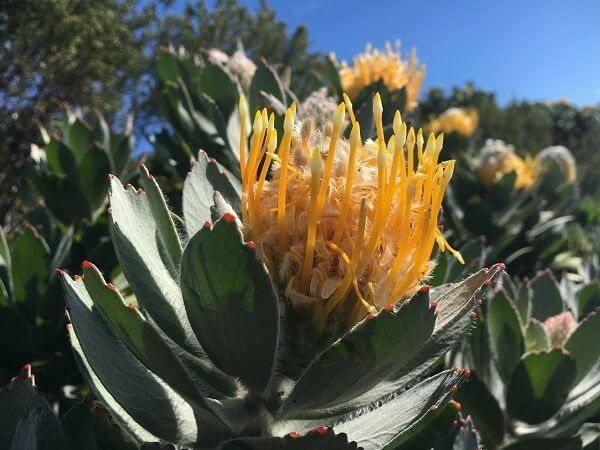 Table Mountain’s Flora and Fauna is incredibly unique, and taking your hiking trip up the prestigious mountain will help introduce you to some great sights and scenes to enjoy and experience firsthand. While there are plenty of adventures waiting to unfold on this age-old sleeping giant such as hiking, rock climbing, and sightseeing, comes an introduction to a wonderful and r beautiful indigenous fauna and flora. Fauna and flora are basically the various animal species and plant life found on the mountain. Some of them can be found throughout South Africa while others are solely found on Table Mountain. Due to the scarcity of some, they need to be protected. And with the establishment of the Table Mountain National Park, we can all see these creatures and plants is in good hands for more years to come. Table Mountain as we know it, is rich with fauna and flora. And hiking up any of the trails gives you the advantage of taking in some of these beautiful sights. Needless to say, there may be too many to see all in one day. Snakes – More than 20 variants of snakes have been accounted for, including the venomous such as the Cape Cobra, Boomslang, Puff Adder, Berg Adder, and Rhinkhals. Antelope – The rarely seen Klipspringer (rock jumper), is one of its kind and first identified in the 1700’s by German zoologist Eberhard Wilhelm. Birds – Table Mountain provides a haven to many creatures including birds due to its diversity of vegetation. You could spot any of these birds including Jackal Buzzard, Steppe Buzzard, Cape Siskin, Cape Sugarbird, Orange Breasted Sunbird, Knysna Warbler, paradise Flycatcher and the Somber Bulbul. Tahr – these goat-like creatures are said to have gotten out from a nearby zoo back in the 1930’s and this resulted in their growing population on Table Mountain where they feed off the fynbos. However, for the sake of preservation of the rare fynbos, authorities may consider relocating the Tahr. Nearby the mountain, you could also spot the Lynx, Cape clawless otter, Cape Fox, genet, and Porcupine, with some roaming freely, while others are kept in the safety of the Cape National Park. 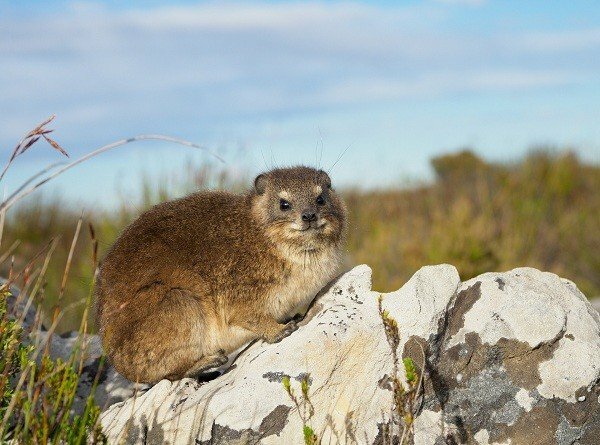 The Dassie (rock hyrax) resembles a guinea pig and is the most common animal on the mountain. Table Mountain is home to some rare frogs and you can often see and hear them on a hike. When it comes to flora, Table Mountain plays host to a variety of plant species, especially Fynbos (delicate or fine bush in English). Fynbos consists of four plant groups, the Proteas, Erica’s, Restios and Geophytes. Fynbos is a very unique vegetation type and has developed over millions of years. It is a fire-adapted vegetation and certain Fynbos needs fire every few years to promote production and dispersing of their seeds. Some of these plant species date back to over 60 million years ago. On Table Mountain alone there are more than 2,200 different plant species. Many of these plants are endemic to Table Mountain and can be found nowhere else in the world. Afromontane Forest grows in the high rainfall areas along certain parts of the slopes on the eastern side of Table Mountain. During the years before preservation, Table Mountain had lost several plant species as a result of fires, human influence, and erosion. 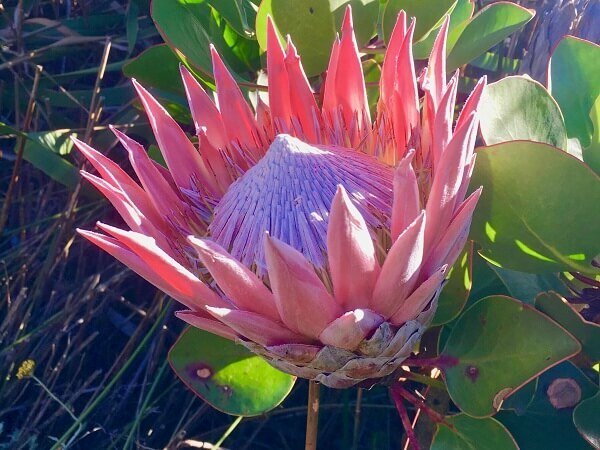 It’s clear to see why special care is taken to the Cape Floristic Region, a UNESCO World Heritage Site, to help maintain and sustain as many of these plants as possible. Hiking on Table Mountain can introduce you to some of the following plants; Peninsula Sandstone Fynbos (endangered), Peninsula Granite Fynbos (critically endangered), Peninsula Shale Renosterveld, Afromontane forest. Some alien plant species are the cause that some Fynbos is becoming close to extinction. Alien plants are a serious threat to our protected plant species and programs to remove these alien plants are ongoing.